Review Captain Jack Casino, Bonuses Ahoy! 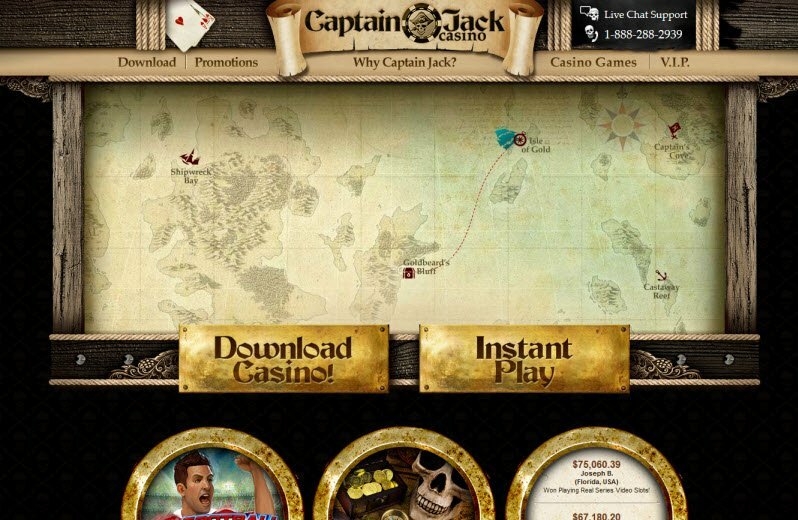 Starting out, the homepage of Captain Jack casino includes an interactive pirate map in which different points on the map reveal different bonuses and games. Goldbeard’s Bluff offers a fun pirate themed slot to play, the Isle of Gold has VIP promos available, Captain’s Cove hides an $11,000 Free Welcome Bonus, and Shipwreck Bay has the Sunken Treasure slot ready to play. The exciting pirate theme of the casino and rewarding bonuses make this one of my favorite places to gamble online. Starting out I had high hopes for this casino about sailing on the high seas. Then I went on to download Captain Jack Casino, and felt a bit disappointed. Where are all the pirate themed images and bonuses? Powered by Real Time Gaming, Captain Jack Casino software runs smoothly and comes available not only, via download, but also offers instant play. Much to my relief, the Instant Play version of the casino looked much better than the download casino. The Instant Play graphics had better quality and suited the pirate theme perfectly. I also found the Instant Play version a bit easier to navigate. As far as the actual casino, Captain Jack Casino games range from slot machines and video poker to specialty games and table games like blackjack, baccarat, and Texas Hold’em. The Captain Jack Casino Welcome Bonus awards 100% Bonus for the first 10 deposits at the casino, making it one of the most lucrative sign up bonuses in the industry. If you don’t like the games offered at the casino, I still recommend this gambling site for the rewarding bonuses available. The Captain Jack Casino Welcome Bonus awards 100% Bonus for the first 10 deposits at the casino, making it one of the most lucrative sign up bonuses in the industry. 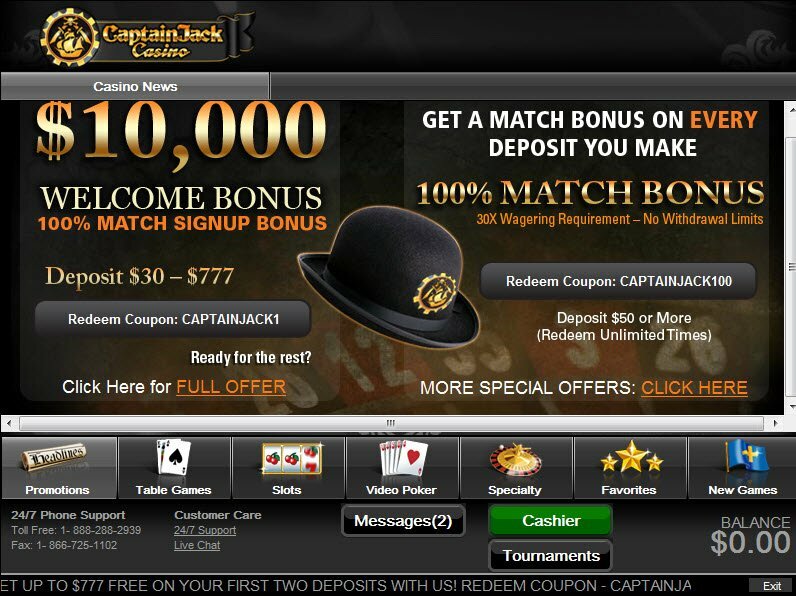 Even after that, Captain Jack Casino bonuses continue to award players with plenty of promotions. 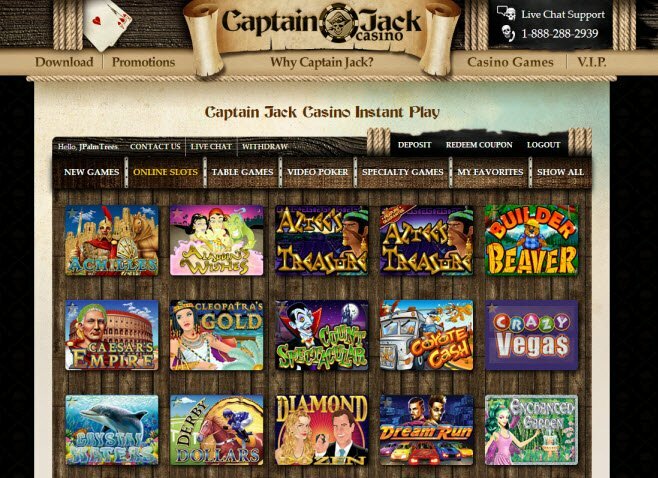 For example, Captain Jack has a 250% All Games Bonus, which players can use on all games at the site. When it comes to making deposits or withdrawing payouts, Captain Jack Casino accepts a nice variety of reliable payment methods. In fact on their website, Captain Jack Casino lists their “honest, transparent, and highly secure transactions” as the number one reason why you should join. The casino even accepts American Express, Visa, Prepaid Card, and Bank Wire, just to name a few. Need help? The Captain Jack customer service agents stand by with “all hands on deck” around the clock to assist players via Live Chat. When I accessed the Live Chat window, a customer service agent came to my assistance right away. In addition, Captain Jack offers customer service via phone, fax (like anyone uses that anymore), and email. What kind of table games do they have at Captain Jack casino? Table games at Captain Jack Casino include baccarat, blackjack, let ’em ride, Texas hold’em, tricard poker, pai gow poker, Vegas 3 card rummy, war, red dog, match play 21, European blackjack, Super 21, face up 21, perfect pairs, and pontoon.